A panel discussion on inspiring possibilities and challenges of community hubs. We’ll hear from experts in sustainable design, climate resilience, affordable housing, social enterprises and community benefits! Our hope is that this panel will provide learning and inspiration that residents can bring to future community consultations about the proposed Parkdale Community Hub at Queen-Cowan. Panelists include: Paul Dowsett (Sustainable TO), Shannon Holness (Community Benefit Network), Emmay Mah (Toronto Environmental Alliance), Marc Soberano (Building Up), and more. A panel discussion on inspiring possibilities and challenges of community hubs. We’ll hear from experts and community members who have been involved in developing arts & culture hubs and/or community hubs that have brought together important community services under one roof! Our hope is that this panel will provide learning and inspiration that residents can bring to future community consultations about the proposed Parkdale Community Hub. Time: 6:30 p.m. – 8:30 p.m. The Parkdale Residents Association is hosting a Provincial All-Candidates meeting. This is Parkdale residents’ opportunity to hear directly from all the political parties running candidates for election in the Parkdale-High Park riding. One of these candidates will be our elected representative in the Ontario Legislature. Time: 6:30 p.m. – 9:00 p.m. Please join us for a Panel Discussion on the options for creating new affordable housing in Parkdale. 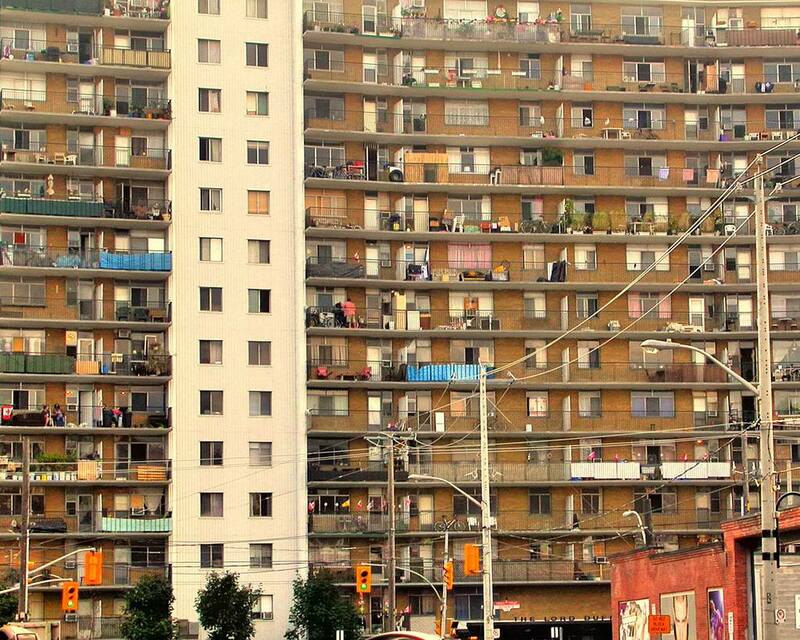 Toronto is experiencing a housing affordability crisis. 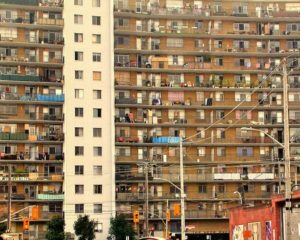 Rents are skyrocketing, pricing low and middle income people our of their communities, while home-ownership is increasingly unattainable for the majority of Torontonians. In Parkdale and beyond residents have demanded “affordable housing now!” This begs the question what options do we have for creating more affordable housing in Parkdale? Panelists will provide an introduction to the opportunities and challenges of some of these options including: Cooperative Housing, Affordable Home Ownership, inclusionary zoning, non-profit rental housing and Community Land Trusts. We will also discuss possible solutions. Mercedes Sharp – Parkdale People’s Economy – What is affordable? 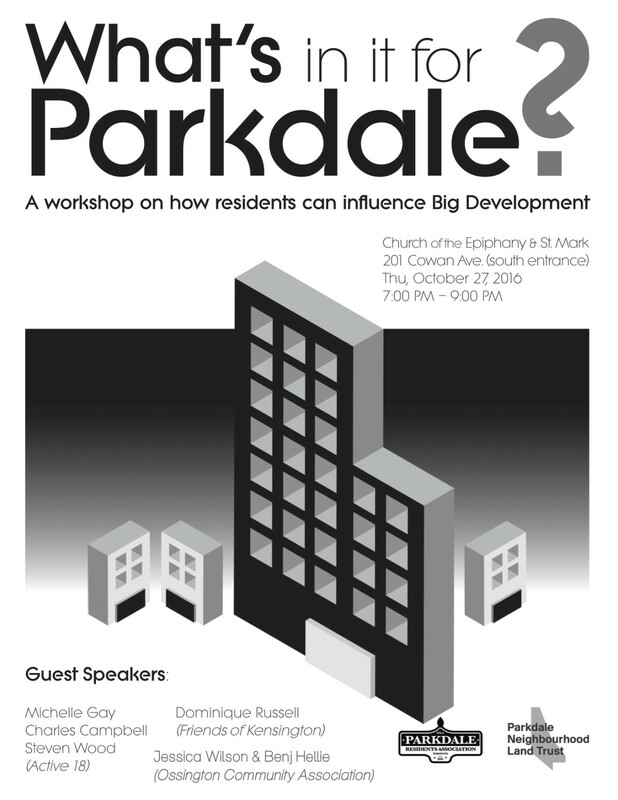 This information session is jointly presented by the Parkdale Neighbourhood Land Trust. You can register HERE. Join us for a panel discussion and workshop on the ways in which residents can influence the development process. Presented by a collaboration between the Parkdale Neighbourhood Land Trust and Parkdale Residents Association. Big development is coming to Parkdale. In the past year, 4 large condo buildings (totaling over 900 luxury units) have been proposed in Parkdale. While residents demand affordable housing and community spaces, these projects offer zero community benefits! This begs the question: what’s in it for Parkdale? How can we assure low-income and vulnerable community members are beneficiaries rather than the victims of neighbourhood development? Speakers include community leaders from Kensington Market, Ossington and West Queen West, who have successfully fought and won community benefits for their neighbourhoods. We’re having a meeting to discuss the future of the Parkdale Resident’s Association (PRA). In particular we are holding this meeting for anyone interested in joining the PRA executive committee. If you are passionate about civic engagement, and are interested in helping steer the future of our neighbourhood, we are hoping that you will join us in this informational session. We are hoping to increase our influence in how our neighbourhood is shaped and need new members. We meet once a month. This is an opportunity for you to get involved and contribute to making Parkdale a better place to live / work. Come meet the Federal candidates running in the Parkdale–High Park riding. This is your opportunity to question the candidates on matters that are important to you AND hear their vision for our community. 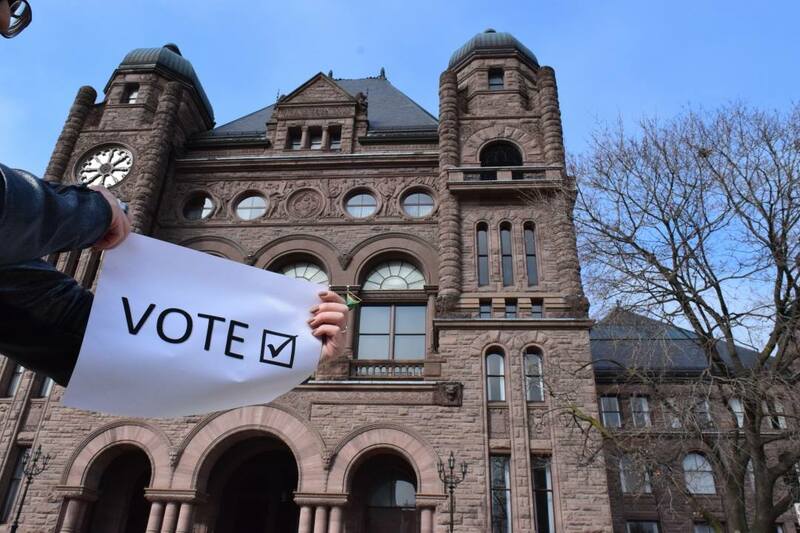 Federal election day is on Monday, October 19th, 2015. Advance polling runs from Friday, October 9th to Sunday, October 12th. Click here for voter information. You are invited to a community meeting to discuss concept designs for Albert Crosland Parkette on Fuller Avenue just North of Queens Street. Join Toronto City Parks staff, Councilor Gord Perks and your neighbours in helping to make this parkette a more welcoming place for residents. Time: 7:00 p.m. – 8:30 p.m. 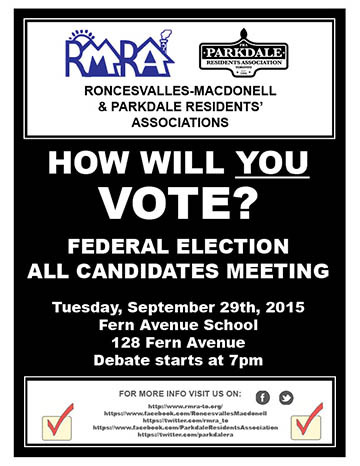 The Roncesvalles-Macdonell Residents’ Association (RMRA) is holding a Ward 14 Councillor and School Trustee debate. The RMRA’s meeting is divided into 2 halves. The 2nd half will be a debate for the Public (5) and Catholic (1) trustee candidates who they have been able to contact and invite. There are important education issues that need attention, that is why they are having the trustee candidates included in their debate program. It will begin at 8 PM so that people may also attend the boundary meeting at Garden PS starting at 6:30 PM – click here for more info. That meeting ends at 7:30 PM allowing enough time to move over to Fern PS and the RMRA debate. Please join us on Wednesday, October 15th for a Town Hall meeting of the leading candidates for Mayor of Toronto. The PRA will be co-hosting this event along with the Parkdale Activity-Recreation Centre (PARC) and the Roncesvalles-Macdonell Residents’ Association (RMRA). Olivia Chow, John Tory, Doug Ford and Ari Goldkind will be in attendance. 5:30 PM – pre-candidate civic engagement “how-to”, for those in the community who are new to the municipal election process. 6:00 – 8:00 PM – Mayoral Candidates Town Hall – each candidate will in turn have 20 minutes to present their platforms and take questions from the audience. City Planning staff are undertaking a study to review the built form standards and heritage character of the properties on both sides of Queen Street West from Roncesvalles Avenue to Bathurst Street. The study will also look at transit capacity and parking in the vicinity of the study area, focus on understanding the character of the street and creating a vision for future development. Please join local residents for this public meeting where you can learn more about this study, ask questions, and share your comments and ideas.